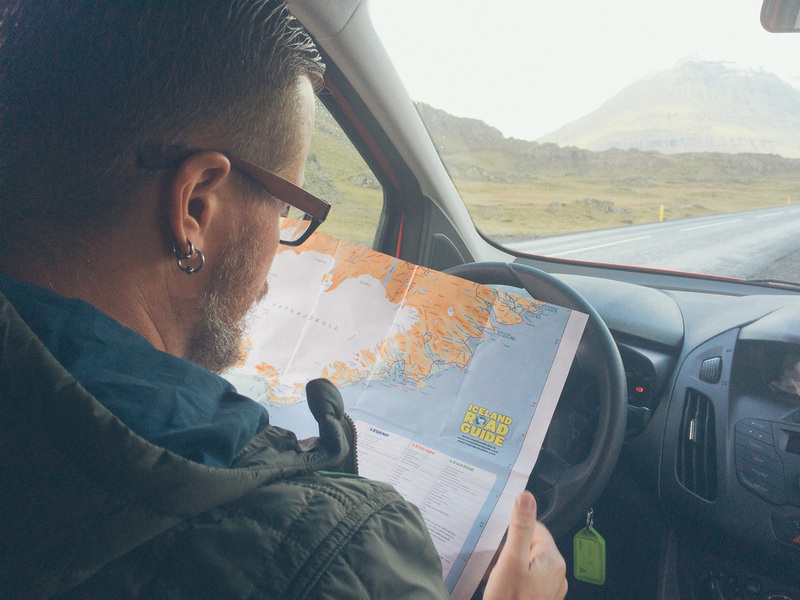 checking a road map while driving the Eastern Coast of Iceland. i’m trying to find my groove again. i’m emerging from a hibernation, of sorts. five days ago i returned home from a two week road trip around the country of Iceland. i’ve kept quiet for the past few days while i tried to recalibrate myself and get back into my regular routine, but sleep deprived time travel is tiring. it’s jarring to your sense of normalcy. the first couple days i was in a foggy, delirious daze, with a nagging headache, unexpected 5pm bedtimes, and unwelcome, wide-eyed 2am morning awakenings. i’ve always had an odd afterglow from travelling, leaning towards a slight depression even, and a confused, "what do i do now?” feeling. going away has always given me a bit of a head-trip, regardless of whether it’s just a quick, three day business trip, or a multi-week adventure. the problem is, to recently fine-tuned and alert new senses, everything seems to look the same once you get back home. everything happens as you'd expect it might. everything seems so normal, which is an odd feeling after just being swept up in a whirlwind of new experiences, interactions, and adventures. one moment after the next you're processing new sights, exotic sounds, unfamiliar smells, and intriguing tastes. you’re meeting interesting new people, and are rapt with curiosities and new tangents of thought. adventure! fun! excitement around every corner! i wonder what will happen next? it all suddenly ends once you walk back through your front door. i suppose it’s a period of mourning perhaps, a grieving for the death of spontaneity and unpredictability. i’m disoriented from being torn from the bliss of truly living in the moment while i was away, out of an absolute necessity for processing the unfamiliar. travelling begs you to be present, it forces you to get out of your head, and to truly live. but when you return home, once you slip back into your routine, it’s often back inside our heads we seem to go. that’s the struggle, to retain the natural awe of seeing things for the very first time, and to bring it into your everyday life. when we travel, it reminds us to not take the beauty of what we have for granted. it reminds us to always look at the world with a fresh perspective, with virgin eyes, with gratitude and appreciation, every day, even if it’s with the surroundings that we assume we already know intimately well. if i ever return home unchanged, then alas, my eyes must have been shut the entire time i was away. travel should open our eyes, not only when we’re away, but also when we rejoin with our regular routine. it should shake us to core, imploring us to look closer at all we have, and to find beauty and wonder in all of the fantastic things that we can possibly do with our lives. so i’m in reflection mode now, trying to process my trip, trying to evaluate what i saw and how i felt. it’s a somber task, but one i enjoy nevertheless. there’s things to be learned, if i dig deep enough. Iceland is a world of wonder, a magical place where you can feel the vibration of the Earth itself. it’s a place of raw extremes, where you can see the land alive and changing, unsettled in a primordial brew, percolating out of the earth, still evolving into something we can’t yet imagine. hmm, kinda’ like me.